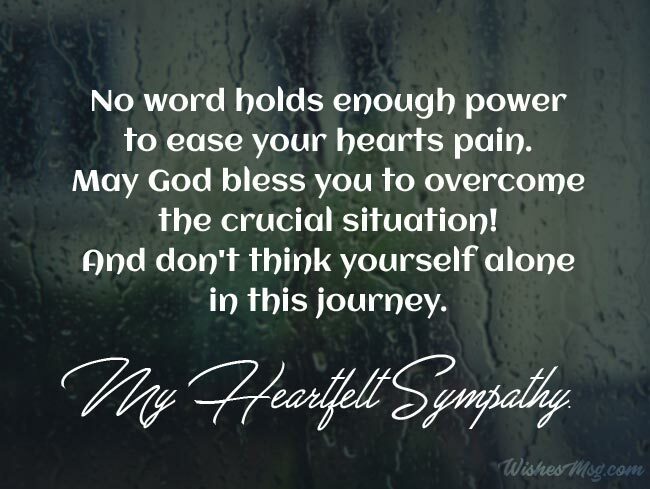 Sympathy Messages : How to offer a condolence or show sympathy to a close one for his/her great loss? We know it is quite tough to find the appropriate word at that moment and you must be wondering what to say that would alleviate sorrow of the bereaved one. It is necessary to make your sympathy messages as like caring and supportive for the one who has suddenly lost his/her close one and feeling helpless, all alone, or shocked. Here we have complied heartfelt sympathy messages that would be helpful to you for expressing sympathy. Lossing someone beloved hurts like hell. It’s the very truth part of human life that each and every one of us has to experience at the various turning point of our lives. Figuring out the right words of sympathy to offer condolences to the bereaved is difficult. Actually, there are no words and nothing you could say that will make the pain go away. All you can just show your heartfelt compassion. However, here are some deepest sympathy messages you can send to a grieving person. Take my deepest condolence. May Almighty give you stability and bless to cope with this tough time of grief. I don’t have the words to express exactly what I’d like to say. Please accept my deepest sympathy for your loss. No word holds enough power to ease your hearts pain. May God bless you to overcome the crucial situation! And don’t think yourself alone in this journey. With heartfelt sympathy, wishing you and your family vigor to face the hard time and strength to come over the grief. I am at a loss for words during this sorrowful time. Please know that I am thinking of you and praying for peace and comfort! Words wouldn’t be enough to express how sorry we are for your loss. Always remember that you’ll receive our complete support in future. Please forgive me for my own loss of words to express my sympathy for your loss. Please let me know if there is anything I can help you within the coming days and weeks. Sending you my deepest sympathy on your valuable loss. You’re in my everyday prayers and thoughts. May God bestow strength upon you to have control over your grief! This hard time will move on and; but the beautiful memory you have would remain the same forever. May God bless you with peace of mind and courage of heart! I wish I could express to you all the appropriate words. All I can say is that I am sorry for your loss and that I want you to know that you mean a great deal to me! Your loss is unfathomable, and I can only offer my sympathy. I am deeply sorry for your loss. The most endearing lady with a great personality- is all I can say about your Mom and no one can replace her. May God bless your Mom’s soul with peace! Sending our heartfelt sympathy for your great loss. Just remember that she can always see you. So don’t be sad, as she wouldn’t like to see you like that. Know our deepest sympathy for the loss of your Mom. She was an adorable lady full of positivity. May she rest in peace! In my eyes, your Mom is the most inspiring person and the loss of a great person like her is irreversible. May God bless her with a heavenly afterlife! Know my sincere condolence for this sudden loss of yours. She was such a lively lady and I’ll always treasure all her memories. May God bless her soul in peace! I am shocked and saddened as well to hear about the loss of such a person of charming personality. May God bless her with a heavenly world! Life can be tough. Sometimes a hug, someone listening, or a conversation with a friend helps. Let me know what you need anytime you need it. Father- The first hero of a child and the person who comes with all supports to his children. Great grief fills the heart when you face the passing by of him. 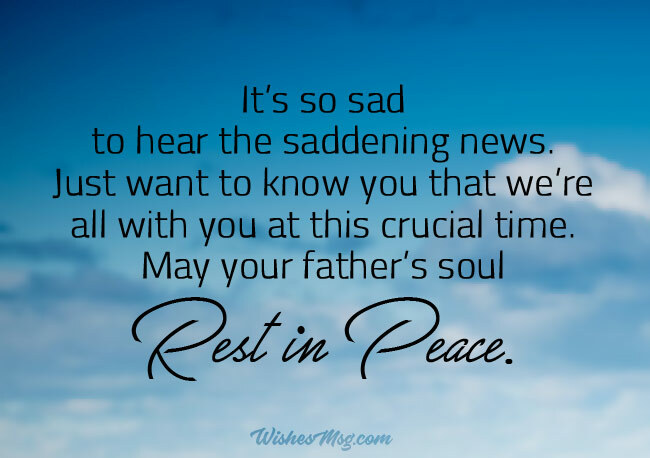 And expressing sympathy to one who has recently lost his/her father is a bit hard as you are not sure about what to write on the sympathy card. Here we have come with few sympathy messages for the loss of a father. Know my deepest sympathy on your great loss. We’ll remember your father as a gentle and inspirational person we’ve ever seen. It’s so sad to know the loss of yours. Your Dad was an amazing person with a great sense of humor. He’ll always be in our heart and live on. We’re still in shock to hear the loss of yours and no words would bring peace to your heart. May God bless his soul a peaceful afterlife! We’re very sorry to hear the news your dead. May God give you the strength to overcome the grief and the audacity to stay strong! We all will miss your Dad for his motivational speaks and that adorable smile on her face. May his soul rest in peace! It’s so sad to hear the saddening news. Just want to know you that we’re all with you at this crucial time. May your father’s soul rest in peace. May his/her soul rest in peace! Though today is a crucial day to see beyond your grief; but cherishing the old memories will heal your heart. True friendship never ends. Your friendship is for eternity and will go on as long you are alive. May God give you strength and comfort! Sending my deepest sympathy for losing your best friend. Hope you would overcome the situation soon and move on in your life. Take my heartiest condolence on such a loss of a lovely person. I can understand how you’re feeling now. May God bestow peace and strength during this crucial time! Though sympathy can’t get your friend back, it’s the reality of life. May God give you the courage to accept it and ease your pain! We’re so sorry to hear the loss of your friend. During this hard time, wishing strength to deal with the situation and bright aspiration for the day ahead. Emotions can become overwhelming at times like these. If yours ever start getting the best of you, let me help you through them. There’s no reason for you to face a challenge like this alone. I wish I could do more than give you my sympathy. Please let me know how I can help. Know that I am here if you need anything and I love you! In an office employee, co-workers or colleagues are like one family. They share their workloads, problems, official issues. Thus they come closer to one another. Sudden death is so shocking and painful to another colleague and also for the family of the co-worker obviously. So, how to express that sad feeling in a formal way? Let’s see the examples below that will help you to understand how to write sympathy messages for the loss of a colleague or coworker. We’re so sorry to hear of your prime loss. He/she was a wonderful coworker. We enjoyed so much working with him/her and will miss him/her always. Our heartiest sympathies are with his/her family. Always remember that you’re in our every prayer and everyday thoughts. We’re at dismay on hearing the news of losing one of our favorite colleagues. He/she was the pride of our company and always will be. The pain of losing a co-worker like him/her is profound; we’ve got the deepest sympathy for his/her family and friends. May God give them the strength to move on in life! A good colleague like him/her is quite hard to find. May God bless his soul with peace and his family with strength to face the tough days ahead! It is a matter of great mourns for us to lose such a nice person like him/her suddenly. Hope his family finds a way to face this sad time. As the days and weeks pass, and as you return to life’s routine, may you continue to feel comforted by the love and support of family and friends! Let God give you strength when you need it. Let Him give you peace and restoration with his love for you. Sympathy is not about using your words to comfort the mind. Sympathy is about using your ears to comfort the heart. 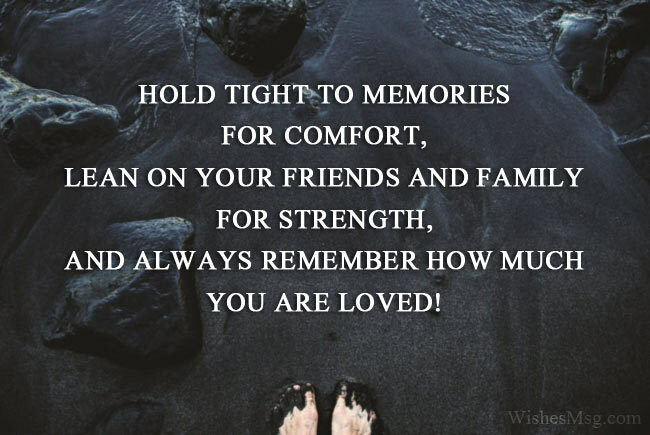 Hold tight to memories for comfort, lean on your friends and family for strength, and always remember how much you are loved! It’s difficult to put into words the thoughts and feelings I have for you in the wake of your loss. I feel strong loss and love for everyone involved. We will need each other as we heal from the pain. When you speak of her, speak not with tears, for thoughts of her should not be sad. Let memories of the times you shared give you comfort, for her life was rich because of you. Life is a continues story where everyone has to experience losses. It’s not easy to share the perfect sympathy messages in honor of a close friend, colleague, relatives or loving person who has fallen in grief for losing something or someone beloved. In fact, there might don’t have really perfect sympathy messages for some kind of loss, though few kind and comforting words can make a huge difference for the grieving person. 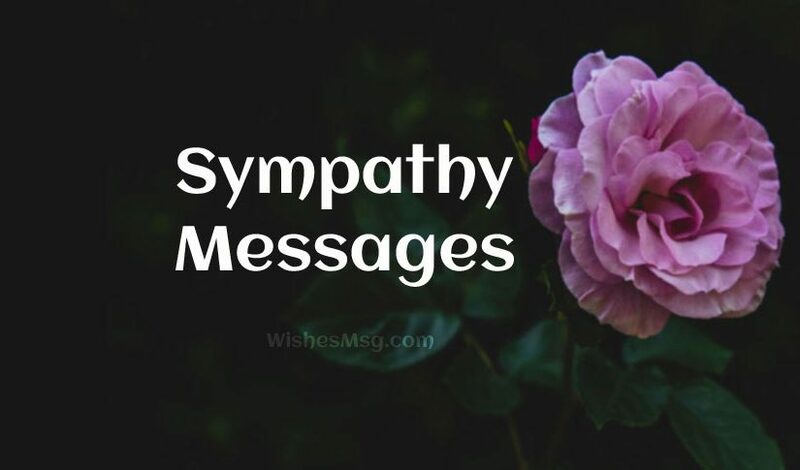 These listed all sympathy messages will give you a clear concept or help you to show your sympathy for such kind of situation and will fit with any kind of losses. These sympathy messages are able to convey your heartfelt sympathy and feelings towards the grieving person.